Cheniere (NYSE: LNG) is the first company in America to be given a license to export liquefied natural gas by FERC. The world became interested in researching Cheniere in 2011 when this authorization was given. Just a few years prior, in 2005, the US was building LNG import facilities as natural gas shortages seemed imminent. Natural gas prices continued to climb from 2005 to 2008 as the world did not recognize the fundamental energy shift sweeping across the planet during the great recession of 2008. From 2008 to 2011, the US & world energy market paradigm was changing fundamentally. With new technological abilities related to hydraulic fracturing and horizontal drilling, natural gas drillers had unlocked the potential of the Eagle Ford and the Mighty Marcellus. Many operators didn’t recognize the fundamental changes taking place in natural gas markets. Cheniere, however, adapted to world markets differently between 2005 and 2011 as they reacted faster than anyone else when they saw the future of natural gas, not the present. Before modern era hydraulic fracturing into the Eagle Ford and Marcellus shales had reached the ears and psyche of America, Cheniere adapted their LNG strategy to be a natural gas exporter. In 2011, Cheniere had the approval they needed and long-term sales agreements locked up with some of the world’s largest energy customers. And now in 2015, Cheniere’s first liquefaction train for export is about to go online. How did Cheniere come to be the first company licensed to export LNG internationally? Let’s begin our recap of Cheniere’s story in the year 2011. Cheniere LNG Facility in Sabine Pass, Cameron Parish, Louisiana. This facility is being built by Bechtel, the 4th largest privately owned company in the US. Bechtel is a construction company based in San Francisco, California. Click to enlarge. In 2011, the board of directors of Cheniere was different than it is today. Two of the board members of Cheniere in 2011 had some inside connections that may have helped with streamlining FERC approval to export: Vicky A. Bailey was the commissioner of FERC as appointed by Bill Clinton and an Assistant Secretary for both Policy and International affairs as appointed by George W. Bush. John M. Deutch was Deputy Secretary of Defense and former Director of the Central Intelligence Agency. The other board members in 2011 had some impressive credentials and financing too, but these two with inside connections specifically may have given Cheniere an upper hand in getting the first FERC approval to export. Investors who bought stock shares when Cheniere was approved for export have made a great return as the stock has run from its $10/share value in 2011 up to the $70/share it’s at today at the time of this article’s publication date. The patience aristocratic investors act with is always amazing to witness. While most Americans, not interested in the science of energy, are only just now about to see the impact of LNG exports on domestic natural gas prices, some big name investors with key connections have been investing billions of dollars since 2005 with a long term view to get a return on their investment. These investors take long term horizons that span decades while other Americans’ finances might span from paycheck to paycheck. Regular folks in the USA that use natural gas to heat their homes, take a hot shower, and dry their laundry might shell out $3 to $4 to $5 per mcf for natural gas to go about their daily activities. Folks in other countries are willing to pay twice that amount for natural gas. Even a $1 or $2 difference in price per unit can mean billions of dollars in aggregate consumption. To try to predict fluctuations in price is what good investors stuck in the middle do. To have a hand in causing those price changes, however, is something only titan-sized investors with resource capital and connections can do. We are literally seeing the shape of the entire world energy market change because of the Eagle Ford and Marcellus shale here in our lifetime and the advent of horizontal drilling and hydraulic fracturing; this is a paradigm change in world energy markets because of natural gas. 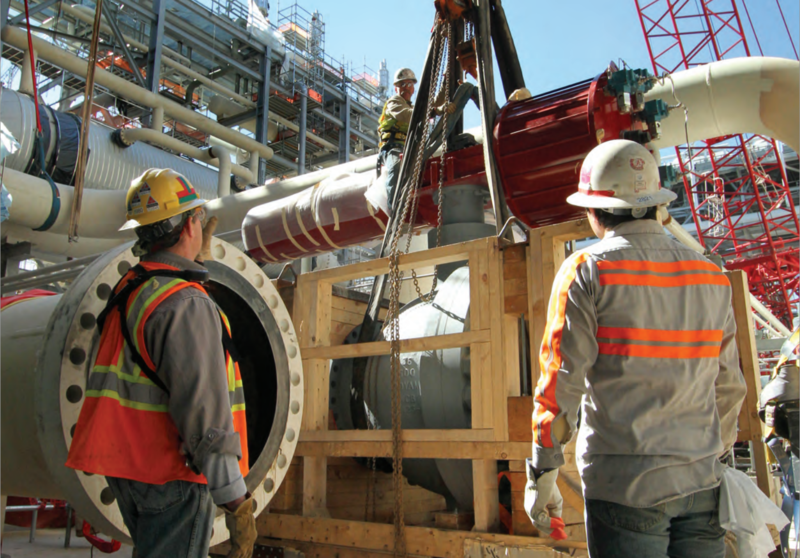 Bechtel workers continue to build Cheniere’s Sabine Pass LNG facility as the United States approaches its first export shipment of LNG overseas which is scheduled to happen before the end of 2015. Click to enlarge. Again, while Cheniere issued their first audited annual report in 2005, the best place to start looking at Cheneiere’s progression to now is to start in their 2011 financial statements. Some key events took place in 2011 that put Cheniere on the trajectory to what’s starting to materialize now 2015. In 2011, two key events took place that were probably a long time in the making. The most major event in 2011 was Sabine Pass Liquefaction receiving authorization from the United States government to export natural gas. This made Cheniere the first company authorized to export LNG. The second important thing to happen is that Cheniere, now with legal authorization to export LNG, was able to quickly ink long term international contracts to export 16 mpta of their forthcoming 18 mpta capacity to BG Group (UK), Gas Natural Fenosa (Spain), KOGAS (Korea), and GAIL (India). It was the swift inking of these deals upon authorization to reputable customers that locked up investor confidence and allowed the stock price to run from $10/share in 2011 to the $70/share price it is today. Cheniere had chosen Bechtel, the 4th largest privately held company in the US, to construct the Sabine Pass LNG liquifaction trains. Cheniere also contracted with Bechtel to plan construction of another LNG export terminal in Corpus Christi Texas with a capacity of 13 mtpa. What is truly amazing to think about is that investment in Cheniere was all being done even before we knew that the Mighty Marcellus would be the monster it is today. We are finding today that the Mighty Marcellus is dwarfing the Eagle Ford by roughly 3:1 in natural gas production. At the time, in 2011, it was the Eagle Ford that provided enough business basis to make the Sabine Pass investment. With the Mighty Marcellus, as we know it today, we can potentially expect to see more LNG export terminals. 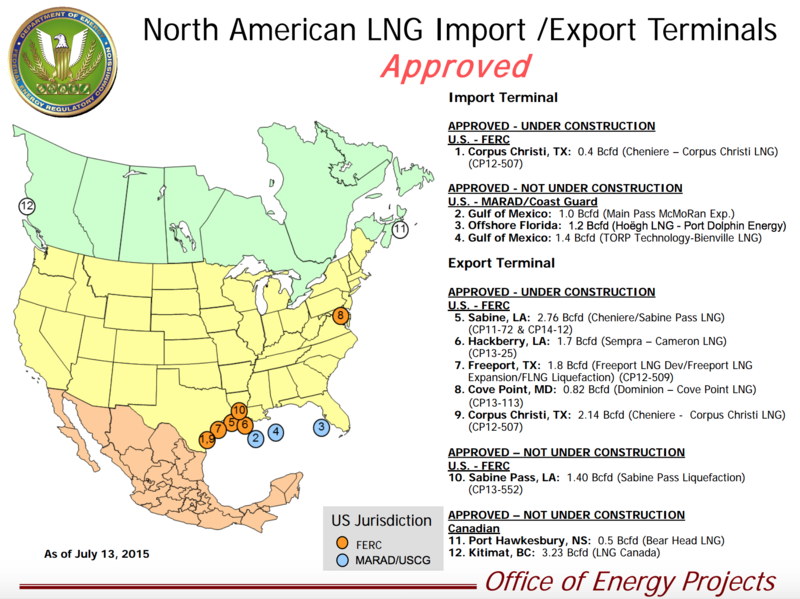 FERC has approved six LNG export terminals and five of those are under construction. It is likely more LNG terminals may be approved for export in the US but may not commence construction for some time to come because of a depression in natural gas prices and the high bar of capital required to build a greenfield facility. FIg 1. – FERC’s July 2015 list of LNG facilities approved and under construction. Click image to enlarge. Demand & pricing is tricky for natural gas now because international markets for gas prices are hitched to oil prices and Saudi actions have changed world oil prices thus changing world gas prices. Other factors like Iran sanctions being lifted could further depress natural gas prices which could further affect the start of construction of new export terminals. Regardless of more LNG export terminals being approved or delayed, it matters not to Cheniere (& Freeport) because they have their entire capacity locked up with long-term sales contracts. 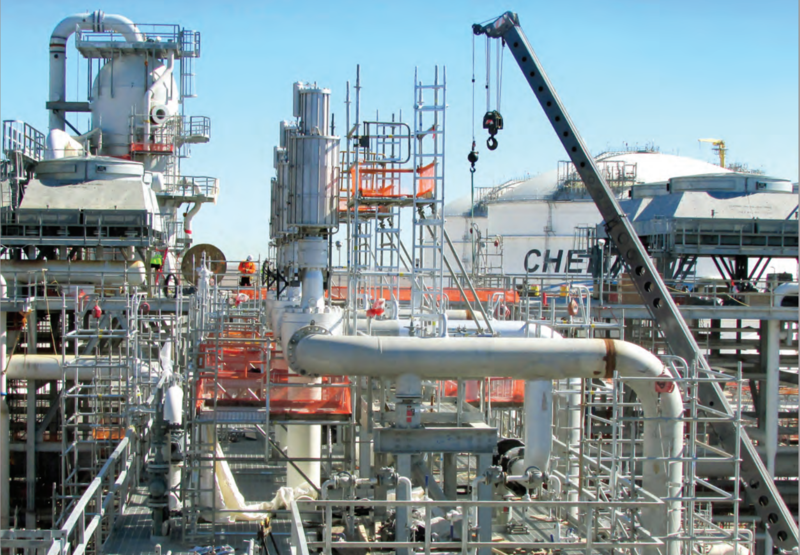 Cheniere expects to begin shipments of LNG out of the Sabine Pass Liquefaction terminal by the end of 2015 or early 2016. There is always risk with the investment of billions of dollars in infrastructure. Barring force majeure, however, the investment Cheniere has made looks like it will have solid financial returns. Other risks, like drastic market price changes, can cause one party to demand a renegotiation of their long term contract originally agreed to. And, if one party refuses to renegotiate the contract price, a price change can be litigated into a less favorable contract than originally agreed to. No one can predict actions taken by Saudi Arabia or possible sanction relief for Iran or other potential world events that can cause global prices to change dramatically, but Cheniere looks like a solid bet for investors ceteris paribus. 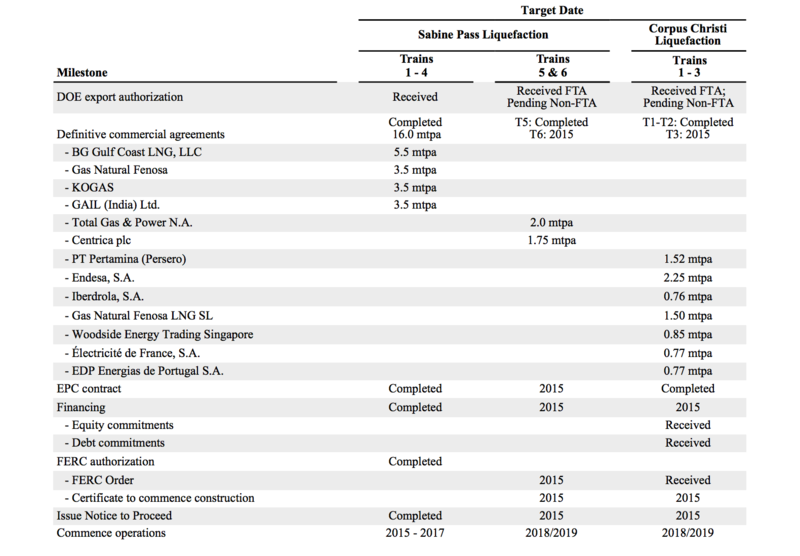 It is most likely we will see the five LNG projects with authorization to export and already under construction (see figure 1) be completed and operational. The downward pressure on gas prices because of oil prices has made Australia, Canada, and Qatar too competitive for the USA to go overboard on too much more LNG infrastructure even though the USA is awash in natural gas; the liquefaction facilities are too costly to risk the investment with oil at $50/bbl. This is why we continue to focus on Cheniere as a poster child for LNG exports in North America and we will also be looking closely at Freeport Texas, Hackberry Louisiana, Cove Point Maryland, Hawkesbury Nova Scotia, and Kitimat British Columbia in upcoming analysis of North American LNG exporters. LNG tankers are specially designed for their one purpose. Many countries are importers of LNG. 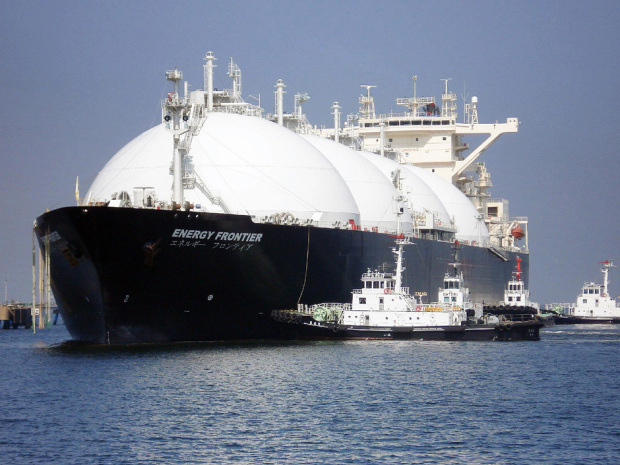 While exporting LNG from the US is new, LNG itself is not. Even still, it is worth going over the basics of LNG and why it is the only economical way to transport it overseas. Natural gas, like any other gas, has a low density which means it takes up a lot of space without having much weight. LNG is natural gas that, through a refrigeration process, has been reduced to a liquid state that occupies approximately 1/600th of its gaseous volume. LNG remains in a liquid state at -160 degrees Celsius (-260 degrees Fahrenheit) at atmospheric pressure. LNG is transported from liquefaction terminals to regasification facilities using ocean going LNG vessels specifically designed for this purpose. If you are interested in learning about LNG supertankers and the science behind them, I recommend you take 45 minutes to watch this educational video that covers the science of LNG in a visual and attention grabbing way. If you’re a schoolteacher, this is a great video to show your students in the classroom. LNG facilities are conventionally designed to either receive LNG or to produce LNG. The Sabine Pass LNG terminal has a receiving configuration with docks to berth LNG vessels, customized unloading arms and transfer piping, cryogenic storage tanks to temporarily store LNG that is unloaded from a vessel, and equipment that pressurizes and heats the LNG to a normal working pressure and temperature in natural gas transmission lines for delivery to markets that consume natural gas. In terminals with a production configuration, the marine, transfer and storage facilities are still required, but specialized feed gas treatment facilities and refrigeration facilities are required to cool the feed gas to its cryogenic state. In constructing the proposed liquefaction facilities at the Sabine Pass LNG terminal, Cheniere Partners took advantage of the existing marine and storage facilities that were constructed for the LNG receiving terminal, thereby saving a substantial amount of capital cost compared to the cost of constructing a greenfield facility. Cheniere believes that even though development of unconventional natural gas resources in other regions may ultimately reduce demand for LNG in some markets over time, LNG serves a variety of requirements and is substantially more flexible than pipeline-delivered natural gas. Cheniere says they believe this flexibility has intrinsic value beyond the price of natural gas and will continue to motivate demand even if unconventional resources are developed in regions such as Eastern Europe, China or South America. 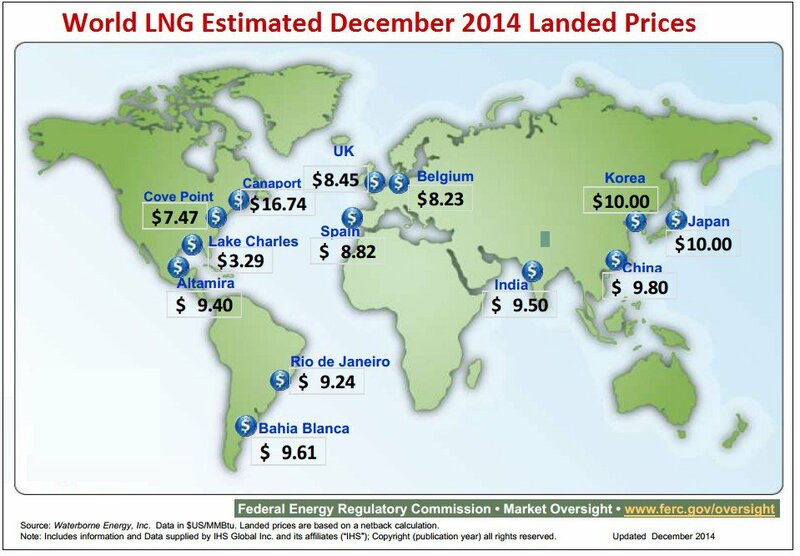 LNG prices in every port in the world are double and three times what they are in the USA. You can do the math. Click image to enlarge. LNG projects generally require development capital not only to build the marine, storage and liquefaction facilities, but also to drill wells and build processing and pipeline transportation infrastructure. Because Cheniere can rely on the natural gas market and transportation infrastructure already existing in the United States, and specifically in Cameron Parish Louisiana, they require less capital expenditures in supporting infrastrucuture and, therefore, are able to sell LNG at a lower price then international competitors. Furthermore, because feed natural gas is purchased from the United States market at a Henry Hub related price, Cheniere can offer LNG for sale on an alternative price index that is not related to crude oil prices, thereby allowing their customers to realize the benefits of lower cost production in the United States while diversifying their portfolio of supply cost indices. And, to reiterate for emphasis, the market dynamics that justified Cheniere’s capital outlay were primarily based only on the increased production capacity from the Eagle Ford. Cheniere was market justified even before the Mighty Marcellus and Utica shales accounted for an 85% increase in US natural gas production from 2012 to 2015 according to the EIA. This is why we cannot rule out more future LNG export terminals along the eastern seaboard in future decades as crude oil prices experience variability. Let’s talk about money and confidence. There’s an old yiddish saying: Mann Tracht, Gott Lacht. It means man plans, god laughs. No one can predict the future, but anyone can make educated guesses. And it’s a pretty good guess, or bet, that if you could afford to invest the billions of dollars it takes to construct an LNG export facility, you should be able to make your money back if you could write a long term contract that is reviewed by your lawyers, signed by your customers, and structured to cover your costs. Many men and women have worked day in and out for years to build what will be the United States first natural gas exporting terminal. The payback period for Cheniere starts this year and begins that march toward breakeven and profitability. The math for Cheniere to make money is simple: money in less money out = profit. It’s as simple as when we look at a Michigan Antrim well or a pizza place down the street. The scale, timing, innovation, engineering, and science, however, have longer horizons and bigger price tags. Let’s take a look at some key parts of Cheniere’s 2014 annual financial report to understand the financial basics of the scale of what they’re executing. Click any image to enlarge. Cheniere’s 2014 financials show they cumulatively lost a half billion dollars from 2010 to 2012. Then, they lost a half billion the next year in 2013 and another half billion in 2014. That’s a lot of money to lose and still have your stock go up and up and up. 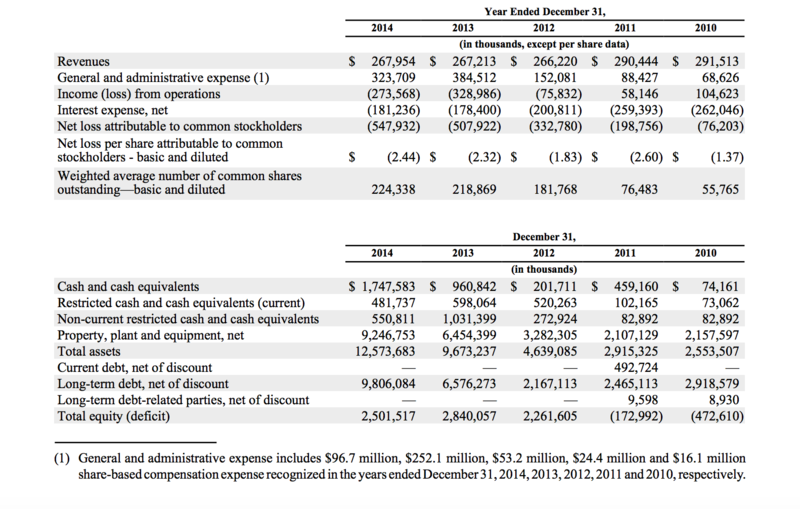 Look at the debt Cheniere will payback in the image below (numbers are in thousands). Click the image to enlarge. Cheniere has over $16.5 billion in debt to pay back yet their stock price is still rated at buy after climbing from $10/share in 2011 to approx $70/share today. Click to enlarge. Lastly, let’s look at the upcoming customer shipment milestones below. Click on the image to enlarge. The image above is from Cheniere’s 2014 annual report. This image shows the 4 trains that go online in 2015 and the when the remaining 5 trains come online for Cheniere. Click on image to enlarge. That’s it for our report on Cheniere energy. Our mapping software at www.respectmyplanet.org has undergone some serious evolution over the past year. While our maps have been focused on Michigan oil & gas wells, we have tons of data configured for our map engine and it’s going to be cool. We will have all the LNG facilities in the world and their stats mapped out just like our map that covers Michigan locations. We have all kinds of stuff coming in future posts including our soon to come and exclusive “geo blog” where we’ve integrated interactive mapping technology with a regular wordpress blog. Join us as we build a mapping engine like no other on the internet to focus on energy, waste, and the protection of ground water resources not just in Michigan, but around the world. Please look at this invention and see its potential and use for your company. US patent 8967274: LNG, cooling system, SELF-PRIMING PUMP, oil fields reviver. USPTO application 13536446 revives depleted oil fields. US patent 8967274: cooling system, SELF-PRIMING PUMP, LNG, oil fields reviver. US patent will revive all depleted oil fields in Texas and California. In this "101" post, RMP writes about the five basic types of fuel cells. Many people may not have heard of fuel cells but they're here today and will be a bigger part of society more and more. Fuel cells generate electricity with only trace amounts of NOx pollution, SOx pollution, and particulate matter emissions. Furthermore, fuel cells produce less CO2 than than other power plants and have higher efficiencies. Even when CO2 is produced, fuel cells can make it more economical to capture that CO2. There are so many benefits that it's hard to name them all in this excerpt. Click here to read this post and bring yourself up to speed on the basics of fuel cells. Read this post about the responsible migration away from crude oil and all the associated benefits it would have for American taxpayers. We can responsibly phase out internal combustion engines and improve our economy and national security. Energy is a tax and the companies that sell us that energy at a profit have formed a monopoly over the transportation sector of our economy. Monopolies are the enemies of a free market. 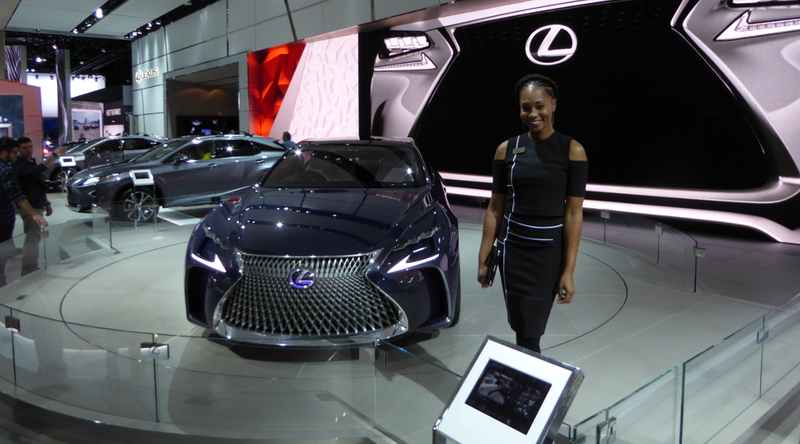 Learn how we can improve America by phasing out the internal combustion engine and crude oil with Fuel Cell Electric Vehicles. 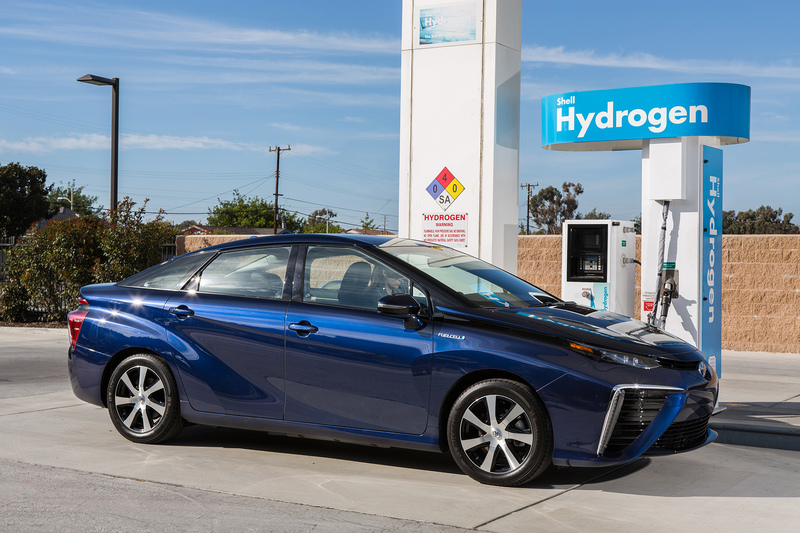 The featured image of this post is the Toyota Mirai FCEV. It is Toyota's first mass produced FCEV. Mirai is the Japanese word for future. If you listen to the TV news and proponents of KXL, you might think the Keystone XL is all about America. But, what if America has little to do with Keystone XL other than we are geographically located between Canada's Athabasca tar sands and a deepwater port to foreign markets? Proponents focus their talk on the 42,100 jobs that will be created by KXL quoting the Final Supplemental Environmental Impact Statement released by the US Dept of State Bureau of Oceans and International Environmental and Scientific Affairs but fail to mention those are short term contract jobs. The very same doc they quote is also quoted by opponents of KXL because it says only 35 permanent jobs will be created. 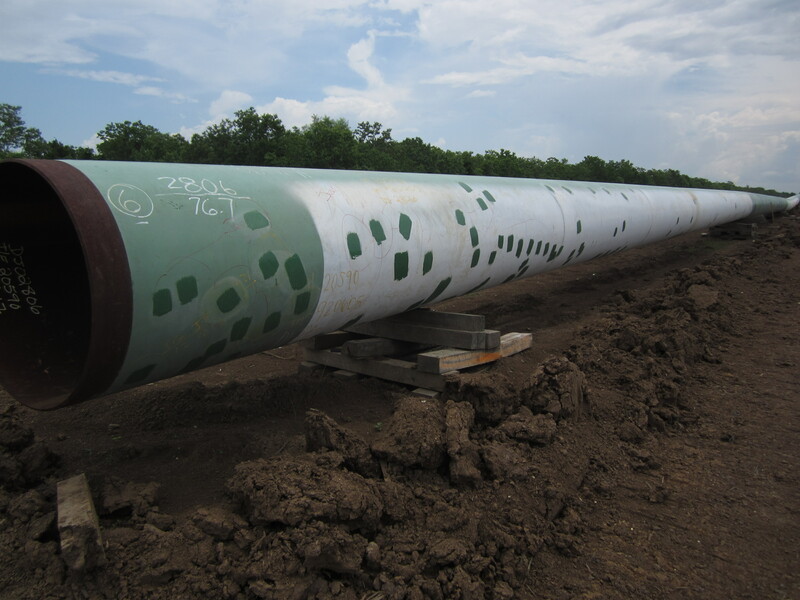 Learn more about America's economic pros & cons with regard to KXL by reading this article.